In his address to the Republican National Convention tonight, Ohio Gov. John Kasich talked a lot about policy, about unions, about debt and surpluses and budget deficits. And then, at the end, he turned to a what seems to be a very personal subject among Ohio politicians and the current administration Kasich would like to be see voted out of office: Golf. "Folks, let me tell you this - Joe Biden disputes a lot of those facts, but Joe Biden told me that he was a good golfer. And I've played golf with Joe Biden, I can tell you that's not true, as well as all of the other things that he says," Kasich said Tuesday at the Republican convention. 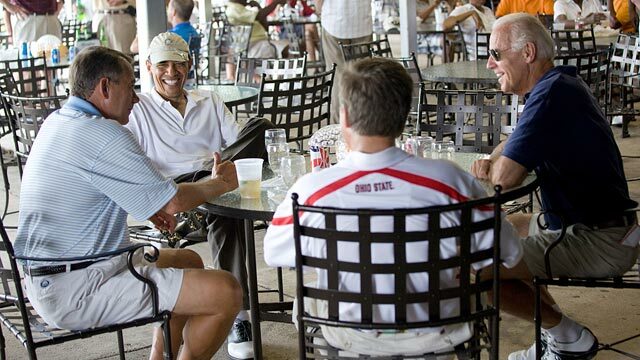 President Obama and House Speaker John Boehner may be at odds over taxes, the debt ceiling and the conflict in Libya, but for today at least, they put aside their differences for a round of golf. Obama and Boehner took on Vice President Biden and Ohio Republican Gov. John Kasich in a game at Joint Base Andrews' golf course in Maryland. The game gave the president and the Republican leader four hours to socialize - with or without discussion of the last week's tense negotiations. Both men play regularly, but Boehner is known as one of Capital Hill's best golfers. Boehner was ranked 43rd among 150 prominent Washington golfers, while Obama is 108th. We didn't mention at the time that Biden is ranked 29 th by Golf Digest. Kasich, who doesn't live in Washington, didn't make the list. For Biden and Boehner, Kasich's partner for that foursome, golf is still the subject of some congenial banter. Before a special address by President Obama to Congress last September, they talked at the rostrum in the House of Representatives about bogies and birdies at a golf course in San Diego. Boehner lamented a four foot putt.